The New Year has officially begun and with it comes the responsibility of creating fun school lunches my girls will want to eat. Our school is quite strict and won’t allow the children to trade lunches but we’ve often experienced school lunches coming home half eaten because the girls “didn’t like it”. Let’s get real here folks, it’s not simple to come up with healthy, entertaining and delicious school lunch ideas. I think I’ve finally found the key, getting the kids involved! It didn’t hurt that they had music playing while they were helping…but hey I can get into that as well. 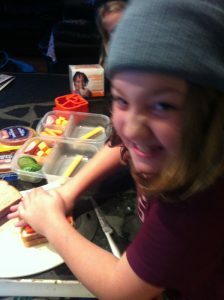 Sydney really enjoyed choosing the shape her sandwich would be cut into, especially when she got to use some brute force! If you don’t have the special sandwich shape cutters we’re using you can easily achieve a fun shape using cookie cutters. This really is a treat for the kids when they aren’t expecting it in their school lunches. Each girl has chosen their school lunch, right down to type of bread. I was impressed that they put time and consideration into the balance of fruit and veggies. The Snack Packs make a tasty treat to finish off their lunches and thankfully they didn’t argue over the adorable Happy Spoon because we had 1 other special mini spoon. They made use of all the space in the lunch container, explaining to me they didn’t like when strawberries touch the bread and make it pink. BRAVO! You can catch up with Snack Pack Canada on Facebook where they have many tips for creating delicious school lunches. One lucky Canadian reader will win a pack that matches the one I received! Entry is simple, just follow the Rafflecopter instructions, winner will be drawn January 30th and have 48 hours to respond. I am participating in theSnack Pack “No Tradesies” blog tour by enCompass Media on behalf of Con Agra Foods. Please review my Disclosure Policy. I make a big batch of smoothies and pour them into the small Glad rounds. Throw them into the freezer and in the morning take one out. By lunchtime, it’s thawed! An awesome school means a lunch that I didn’t throw together last minute! So we prep the night before and make sure to include healthy and fun snacks. I separate out the fruit, snacks, and etc into small baggies for the entire week. That way in the morning it’s either to throw it all together. Love those ideas above me! I have to agree though that a make ahead lunch is always the better lunch around here. I have the silicone muffin tins to seperate the finger foods in a sandwich holder. Home made and healthier lunchables. I always put a note in my kids lunch bag…Love ya, Work hard, Good luck on your test…or a joke or funny comic . They loved it. I precut up my fruits and veggies on Sunday for the lunches. I make a menu plan every Sunday and get groceries for the week – much less stressful each day! Fruit lots of fruit, they love fruit. Be creative. If it looks cool, they’ll eat it. The kids love “themed” lunches…. e.g., the TOMATO lunch consists of spaghetti, grape tomatoes, and ketchup chips. I invested in mini-cupcake and loaf pans. On the weekend, the kids and I will make mini cupcakes or banana/raisin/plum/peach/etc. bread and that’s what they take for lunch as dessert. Since they helped make it, they have ownership on it and I’ve only had empty lunch boxes coming home since doing this! Have the kids make their lunches with you! One fun treat for lunch are apple sandwiches. We use our apple peeler to core and slice two apple pieces and then we put peanut butter inbetween. I like to decorate their sandwiches with veggies so they resemble a face. I also take the kids shopping for lunch stuff and ask them to help make them with me. I homeschool, so my kids have never had a school lunch, but they still enjoy it when I make their food fun to eat. They really like dipping apple slices into peanut butter. Let them help choose from options you provide. A good tip I use is to let them pick what they want to pack for lunches. Kids like things in interesting shapes. I cut cheddar cheese into fun shapes with cookie cutters. Have the kids help shop for their own lunch items, especially the treat portion. I used to love finding a note in my lunch from one of my parents as a kid. Lots of shapes and colours. I cut my daughter’s sandwiches into little shapes. She gets a kick out of it..
Usually on Sundays I bake something a little more healthy. Yesterday I made Pumpkin Raisin Muffins. No white flour…only whole wheat flour and wheat bran. 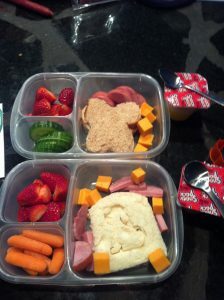 Let the kids prepare the lunch with you and make cute shapes with their food, all kids love that! Let them choose what goes in the lunch. For awesome school lunches I have made sandwiches and cut them into fun shapes with a cookie cutter before packing them into the lunch bags. I try to make different types of sandwiches & wraps and add healthy snacks such as veggies with dip and yogurt and fruit. They help to pick out what they like to eat. have the kids help make their lunch. let the kids pick out one snack at the grocery store. add this to their lunches. I use a panini maker and make Taco Bell style crunchy wraps for the kids and they love it. It is fast and easy and you can change up the ingredients easy so they don’t get bored. Give a few dip options or flavoring options, like various dressings for salads or vegetables, or peanut butter for celery or apples! Instead of buying Lunch-Mates, you can make your own. It is cheaper and healthier. I make my own version of the pizza ones all the time for the kids. i get the containers with dividers in them from the dollar store and i put several different foods in each spot. sandwiches get boring so i put different food in the lunch and often a thermos is great for something really different. and always a little note of praise goes a long way. I bought them special cars and Spider-Man Tupperware containers so they enjoy opening and using them in their lunch. I let my kids help choose what to pack in their lunches! 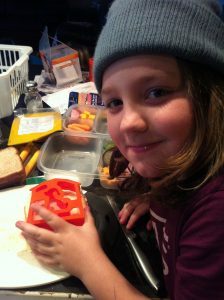 If the kids help make the lunch they will think its awsome and more likely to eat it. I often include short notes or jokes to cheer them up on a boring day. Change it up and pack one “treat” that your kid likes! I love the sandwich cutters! Anything to make school lunches easier!!! My tip is to include a frozen yogurt that will thaw so the child can enjoy it. I pack crackers and I use cookie cutters on hard cheese to cut out shapes also when I cut an apple I use lemon juice and pour it over it and then use an elastic band to keep it together so it doesn’t turn brown. Shapes like hearts are fun! Ask your kids what they want from a list of healthy items that the LIKE eating. Small toys can make lunch a little more fun. Bring the kids shopping so they can help make decisions on what they want and learn how to make good food choices! I’ve made monster sandwiches. you cut a mouth in the sandwich top piece, use cheese for teeth, I’ve used sausage for ears, raisin pock marks, etc. I’m not the best creative lunch maker, but this one gets my son to eat things he might not normally eat because it’s a ‘cool’ sandwich. the best thing is allowing the children to pick out what they want to eat, then nothing gets wasted.